Planning to buy a new Mac for someone on your holiday shopping list? Such a thoughtful and generous gift is going to make someone very, very happy. Now comes the hard part: Which Mac should you buy? That’s where we come in. We’ve tested every standard-configuration Mac model currently in Apple’s lineup, and we know each model inside and out. We’re happy to help you make a decision. This buying guide explains all the Mac models available and how they’ve changed from their predecessors. To read the full review for each Mac, click on the “Read our complete review” links. You can also get more details on how each Mac did in our benchmark tests. And we’ve provided links to help you find the best prices. The 2011 MacBook Air line uses Intel dual-core Core i5 processors, a vast improvement over the Core 2 Duo processors used in previous models. Macworld Lab found that the 2011 MacBook Air models are at least 1.5 times as fast as last year’s 11-inch MacBook Air with a 1.4GHz Core 2 Duo processor. With some older games, however, the current models may suffer a hit in graphics performance. The 2011 models’ key new feature is the Thunderbolt port. Past MacBook Air models had only USB 2.0 connectivity; Thunderbolt gives the 2011 MacBook Air a high-speed connector, and widens the range of peripherals you can use. You can either get the proper adapters to connect FireWire, eSATA, USB 3.0, or other devices to the Thunderbolt port, or you can get Apple’s Thunderbolt Display, which serves as a connectivity dock for the laptop. Configurations: There are four MacBook Airs: two 11-inch models and two 13-inch models. All come with flash storage and Intel HD Graphics 3000. The entry-level 11-inch MacBook Air has a 1.6GHz Core i5 processor, 2GB of RAM, and 64GB of flash storage for $999. (Get best current price.) The other 11-inch MacBook Air has the same processor, 4GB of RAM, and 128GB of flash storage for $1199. (Get best current price.) Both 11-inch models feature a high-resolution LED backlit glossy display with a 1366-by-768-native resolution. The only difference between the two 13-inch MacBook Air models is the amount of flash storage. Both 13-inch models feature a 1.7GHz Core i5 processor, but the $1299 13-inch MacBook Air (get best current price) has 128GB of flash storage, while the $1599 13-inch MacBook Air (get best current price) has 256GB. Performance: The MacBook Air is quite capable of handling everyday tasks, such as emailing, Web browsing, using office applications, and more. You can even use it for editing short videos, and working with JPEGs from your iPhone or point-and-shoot camera. The 11-inch MacBook Air is the slowest Mac in Apple’s lineup, but it’s no slouch. It’s much faster than last year’s 13-inch MacBook Air. Also, the 11-inch MacBook Air, thanks to its flash storage, is about as fast overall as the $1199 13-inch MacBook Pro with a dual-core 2.4GHz Core i5 processor and a 5400-rpm 500GB hard drive. The 2011 13-inch MacBook Air is about 28 percent faster overall than the last year’s 13-inch MacBook Air. Macworld’s buying advice: Previous MacBook Air generations were thought of as niche laptops. But now, the 2011 MacBook Air is the ideal laptop for most Mac users. It’s a great combination of performance and portability. The MacBook Pro was actually updated twice in 2011. The first update was in February, and the most recent MacBook Pro line was released in October. The MacBook Pro continues to sport the aluminum unibody design that was introduced in 2008, but it has more features and processing power than the MacBook Air. Consider the MacBook Pro a possible replacement for an older desktop Mac. The current models feature Core i5 and Core i7 processors that are slightly faster than the models released in February. The speed differences are bigger if you compare the current MacBook Pro line to the models released in 2010; most notably, the 2010 13-inch MacBook Pros used slower Core 2 Duo processors. The new 13-inch MacBook Pros still use only an integrated graphics processor, the Intel HD Graphics 3000. The 15- and 17-inch MacBook Pros have both the integrated Intel HD Graphics 3000 and a discrete graphics chip. Configurations: There are five standard configurations of the MacBook Pro. There are two 15-inch models. For $1799, you get a quad-core 2.2GHz Core i7 processor, a 500GB hard drive, and a 512MB AMD Radeon HD 6750M discrete graphics chip along with the integrated Intel graphics. (Get best current price.) The next model up (at $1999) has a quad-core 2.4GHz Core i7 processor, a 750GB hard drive, and a 1GB AMD Radeon HD 6770M discrete graphics chip along with the integrated Intel graphics. The 15- and 17-inch MacBook Pros are the only laptops in Apple’s lineup that offer a high-resolution antiglare screen option. It costs an extra $150 for the 15-inch MacBook Pro, and an extra $50 for the 17-inch MacBook Pro. Performance: The $1999 15-inch MacBook Pro 2.4GHz Core i7 was the fastest laptop in our Speedmark 7 testing. The $1199, 13-inch 2.4GHz Core i5 MacBook Pro offers performance that’s similar to that of the $999 11-inch MacBook Air with a 1.6GHz Core i5 processor and 64GB of flash storage, but the MacBook Pro has features the MacBook Air lacks, including FireWire 800 and a bigger screen. Macworld’s buying advice: The MacBook Pro combines the performance of a desktop computer with the portability of a laptop. If you want the fastest MacBook Pro, the 15-inch 2.4GHz Core i7 MacBook Pro is the one to get. If you primarily want a device for travel and are trying to decide between a MacBook Air and a 13-inch MacBook Pro, go for the MacBook Air, unless you really need the processing power for heavy-duty tasks or you want a computer with FireWire built in. 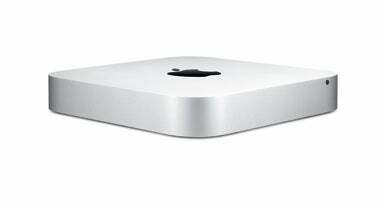 Designwise, the 2011 Mac mini hasn’t changed much compared with its predecessor. It’s still a small aluminum square that sits modestly on your desk. The change that does stand out—and may influence your buying decision—is that the Mac mini no longer has a SuperDrive. If you want to burn music CDs or DVDs, or read data from an optical disc, you need to get an external optical burner, which costs $60 to $100. If you absolutely want an internal SuperDrive in your Mac, opt for a laptop or an iMac. The 2011 Mac mini has a Thunderbolt port, which replaces the Mini DisplayPort in the older model. The Mac mini also has an HDMI port, a FireWire 800 port, four USB 2.0 ports, a gigabit ethernet port, an SDXC Card slot, and analog/optical-digital audio input and output minijacks. Wi-Fi and Bluetooth are built-in. Configurations: The $599 Mac mini has a dual-core 2.3GHz Core i5 processor, 2GB of RAM, a 500GB hard drive, and Intel HD Graphics 3000 integrated graphics. (Get best current price.) The $799 Mac mini has a dual-core 2.5GHz Core i5 processor, 4GB of RAM, a 500GB hard drive, and AMD Radeon HD 6630M discrete graphics. (Get best current price.) You supply your own keyboard, mouse, and display. Performance: In 2010, Apple released only one nonserver Mac mini model, which had a 2.4GHz Core 2 Duo processor, 2GB of RAM, a 320GB hard drive, and Nvidia GeForce 320M integrated graphics. The 2011 Mac minis are significantly faster than the older model: The $599 Mac mini is 32 percent faster, and the $799 Mac mini is 61 percent faster. The Mac minis still lag signifcantly behind the iMacs, but for general-purpose use and editing of moderate-size videos, the Mac mini will do fine. Macworld’s buying advice: The Mac mini continues to be a nice, affordable computer for new Mac users and shoppers on a budget. It has enough power for everyone except professionals who demand top performance. Be sure to shop around for an external disc burner if you really need an optical drive. Apple hasn’t changed the design of its aluminum all-in-one desktop computer for a few years now, because it’s a design that works. It elegantly fits the components and display into an iconic form. The company updated the line in May with new processors and graphics chips. The iMacs are available with 21.5- and 27-inch widescreen 16:9 displays. The iMac comes with Apple’s Wireless Keyboard and Magic Mouse, but if you order online from the Apple Store, you can switch the keyboard to a wired version with a numeric keypad, and switch the mouse to an Apple Mouse or a Magic Trackpad, for no extra fee. You can opt for both a Magic Mouse and a Magic Trackpad for $69. All iMacs come standard with 4GB of RAM, a SuperDrive, Wi-Fi, Bluetooth, gigabit ethernet, a FaceTime HD camera, four USB 2.0 ports, a FireWire 800 port, an SDXC Card slot, audio in and out jacks, and built-in speakers. A Thunderbolt port is also included. Configurations: There are two 21.5-inch iMacs. The first 21.5-inch iMac has a quad-core 2.5GHz Core i5 processor, a 500GB hard drive, and a 512MB AMD Radeon HD 6750M graphics card for $1199. (Get best current price.) The second 21.5-inch iMac has a quad-core 2.7GHz Core i5 processor, a 1TB hard drive, and a 512MB AMD Radeon HD 6770M graphics card for $1499. (Get best current price.) Each 21.5-inch iMac has one Thunderbolt port. There are two 27-inch iMacs. The 27-inch model with a quad-core 2.7GHz Core i5 processor, a 1TB hard drive, and a 512MB AMD Radeon HD 6770M graphics card costs $1699. (Get best current price.) Then there’s a 27-inch iMac with a quad-core 3.1GHz Core i5 processor, a 1TB hard drive, and a 1GB AMD Radeon HD 6970M graphics card; it costs $1999. (Get best current price.) Each of the 27-inch iMacs comes with two Thunderbolt ports. Performance: The four 2011 iMacs are considerably faster than the systems they replace. The $1199 21.5-inch iMac was nearly 24 percent faster overall than last year’s entry-level 21.5-inch iMac, which had a dual-core 3.06GHz Core i3 processor. The $1699 27-inch iMac was 25 percent faster overall than last year’s 27-inch iMac with a dual-core 3.2GHz Core i3 processor. The $1999 27-inch iMac was 16 percent faster than the previous high-end standard-configuration iMac: a 27-inch quad-core 2.8GHz Core i5 model. If you exclude the $4999 12-core Mac Pro, the $1999 iMac ranks as the fastest standard-configuration Mac. In fact, all of the iMacs except for the $1199 model compete very well on performance when compared to the Mac Pro. Macworld’s buying advice: The $1199 21.5-inch 2.5GHz Core i5 iMac offers the most bang for the buck. If you want top performance, then go for the $1999 27-inch 3.1GHz Core i5 iMac. In fact, if you want a computer for heavy-duty processing work, consider an iMac over a Mac Pro. The only difference between the $1499 iMac and the $1699 iMac is screen size; they have the same components. Oh, the Mac Pro. Apple hasn’t updated this workstation since August 2010. Rumor has it that Apple may stop making the tower Mac. But for now, it’s still available, and it’s still a solid computer for the most demanding users. The entry-level Mac Pro features a quad-core processor, while the top configuration has 12 processing cores. In between is a Mac Pro model with eight processing cores. All the standard-configuration models feature a 1TB ATI Radeon HD 5770 graphics card, a 1TB hard drive, four hard-drive bays, four PCI Express expansion card slots, four FireWire 800 ports, five USB 2.0 ports, two independent gigabit ethernet ports, Wi-Fi, Bluetooth, and audio in/out jacks. The Mac Pro is the only Mac that is not equipped with Thunderbolt. Configurations: The first Mac Pro has a quad-core 2.8GHz Xeon Nehalem processor and 3GB of RAM. It costs $2499. (Get best current price.) The second Mac Pro has two quad-core 2.4GHz Xeon Westmere processors and 6GB of RAM for $3499. (Get best current price.) The third Mac Pro model has two six-core 2.66GHz Xeon Westmere processors (for a total of 12 cores) and 6GB of RAM for $4999. Shopping for a new Mac? Here's the lowdown on Apple's offerings to help you decide which Mac to buy. On the market for a portable hard drive? Our guide will help you make the right decision.